The Mass Adapted for Children is typically celebrated the last Sunday of the month, September through April at the 9:30 am in the church, with a special celebration on Christmas Eve. 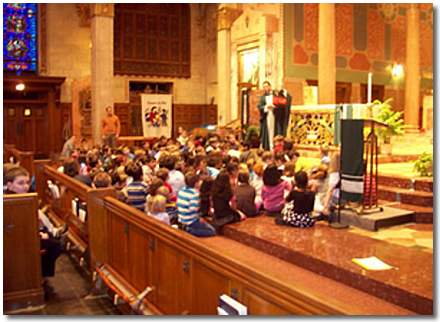 Families in the parish Religious Education program and parish school take an active role in the liturgy as greeters, lectors, gift bearers, ushers, and Eucharistic ministers. The Children’s Choir leads us in song for this liturgy. The readings and homily are geared toward the children in the assembly, with a theme for parents/adults in the assembly to build on at home during the week.